Sarah Pierce is an artist based in Dublin, who is making a newly commissioned work at the Mattress Factory for the show Neighbo(u)rhood. Her focus is the University of Pittsburgh campus. She is interested places where students gather, in various registers of "organization" from classroom learning, to political demonstrations, to student government, to campus clubs. As part of this new work, Pierce is producing a new performance that will take place during the opening of the exhibition on May 13, 2011 from 6 - 8 p.m. She has collected various quotes from student protests and the Black Action Society dating back to 1959-1969, as well as recent ones from studio art classes and student senate meetings recorded in April 2011. These quotes will be incorporated into the performance, along with a series of simple 'gestures' performed by a group of 8-12 volunteers. It's time to sign up to become a part of the art! If you are interested in participating as a volunteer for the performance (any and all are welcome), please contact Lindsay at the Mattress Factory at lindsay [at] mattress [dot] org or post a comment below. 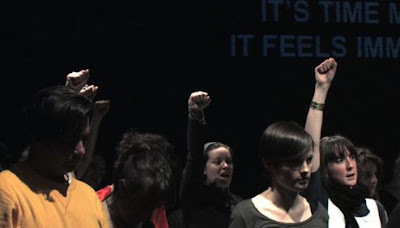 TIME COMMITMENT: Volunteers are asked participate in a closed workshop on Thursday, May 12 from 6 - 8 pm at the Mattress Factory, with Pierce to develop / rehearse the performance. There will be a short 'rehearsal' on May 13 at 6 pm, and the performance is at the Mattress Factory during the opening reception of Neighbo(u)rhood on May 13 from 6 - 8 pm. No performance, drama, or dance experience required. All are welcome to volunteer, age 18 and older please. Hello! We are once again gearing up for an incredibly active ARTLab this Saturday in our lobby from 1:00-4:00 pm. This month’s projects involve two of our artists-in-residence. We’ve been recruited by artist, Glenn Loughran, to help create pieces for his upcoming installation in Neighbo(u)rhood (opening May 13th). 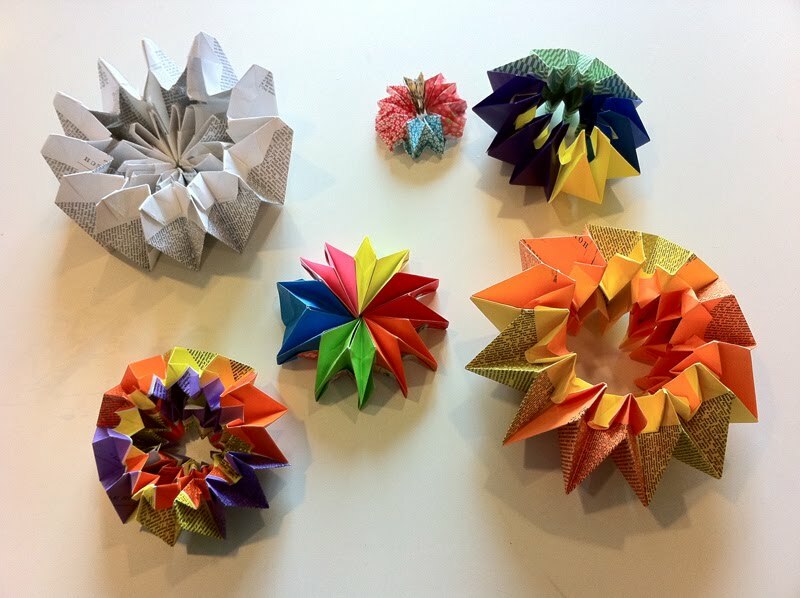 Visitors are invited to create origami paper fireworks with the help of MF volunteers and staff. 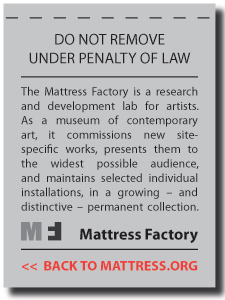 This is an exciting opportunity to contribute to an installation that will be shown here at the Mattress Factory during the running of the show. Don’t have the mind for paper fireworks? Not a problem! 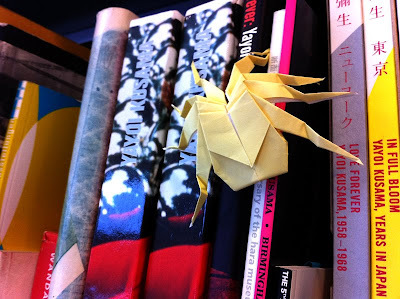 We will also be creating smaller (i.e., easier to create) origami creatures for those of you who are intimidated by twelve pieces of paper. In addition, these tiny creatures will be scattered throughout the Mattress Factory galleries as a small nod of compassion to those who are struggling with the aftermath of the earthquake and tsunami of March 11, 2011. For the past month and a half one of our artists, Yumi Kori, was here working on a piece for a special education project that will debut in September. During her stay, Japan’s earthquake hit and she watched her home struggle as the disaster unfolded. Yumi continued on with her work here but she will shortly be returning back to her home. To show our support, The Mattress Factory will be collecting donations for the Japan Society this Saturday to help those affected by the earthquake in Japan. Any little bit will help. We would like to thank the many visitors that take the time to visit and to participate in our programs. The level of support and creativity that our guests offer constantly amazes us. Thank you and we hope to see you on Saturday! Cost? None. Come on by. How much can you do with 40¢? Apparently a whole lot when you're Lea Bertucci and Ed Bear. This Brooklyn-based artist/engineer team got creative with a now-obsolete piece of technology, the iTrip. Back in 2005, the 1st generation iTrip was a semi-popular FM radio transmitter created for an Apple Nano iPod that is no longer manufactured. Lea and Ed have found a way to use this once $49.99 (now they can be found on eBay for a mere 40¢) piece of technology for creative and thoughtful artworks. "An express goal of this project is to empower artists with diverse technical and creative backgrounds to create works using radio," share Lea and Ed. "This constitutes a social experiment and community building exercise that documents creative responses to a common tool. How can we, as artists, thinkers, hackers and designers break the cycle of electronic waste that is perpetuated by planned obsolescence and bad design?" 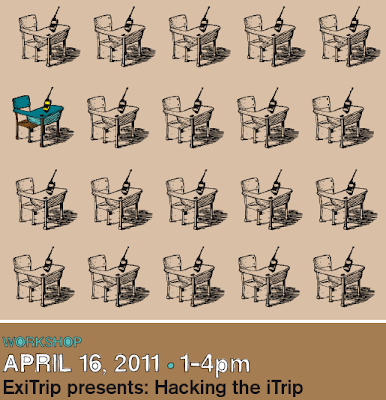 Join us on Saturday, April 16, 2011, from 1:00-4:00pm for a special ExiTrip workshop to learn how to make your very own hacked low power transmitter. Not only will you learn how to hack an iTrip (yup, you'll be using a soldering iron), you'll get to take it home with you and brag to all your friends. 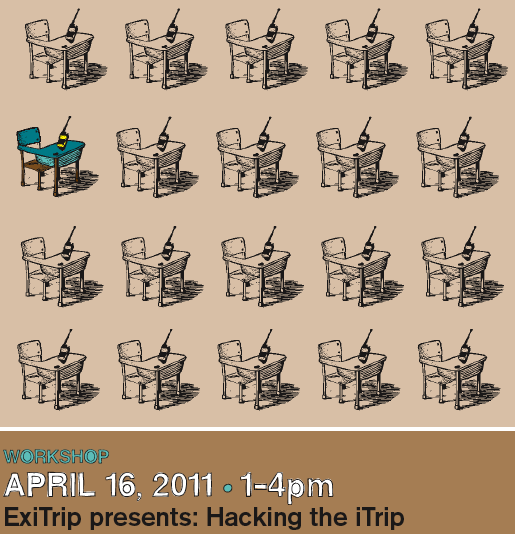 How to Hack the iTrip from Lea.